NEW BRIDAL COMBS! ~ Comb comes with or without feathers - choose from the drop down menu! The Love Story is excited to introduce our new line of bridal combs! 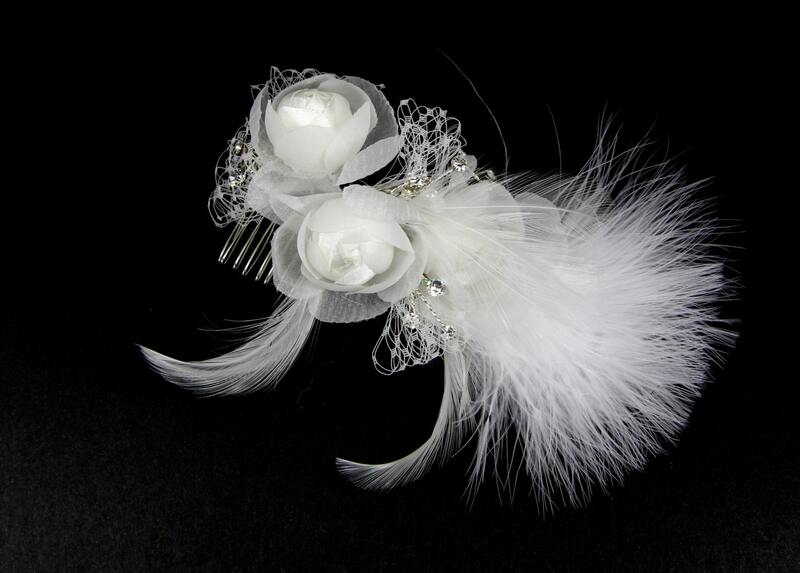 This beautiful feathered hair comb is absolutely gorgeous! The comb is adorned with lovely silk rosettes, a tiny tuft of tulle, a plume of exquisite white marabou feathers and sparkling rhinestones. Our combs come beautifully packaged in a black box to make the perfect wedding gift! Other feather colors available: White (as shown) / Grey / Black / Hot Pink / Tiffany Blue / Purple / Yellow. If you do not see your color, please send us a convo and we will do our best to accommodate! You can also purchase the comb without any feathers. very cute and well made. Love the comb. Excellent quality. Made it through all kinds of conditions!